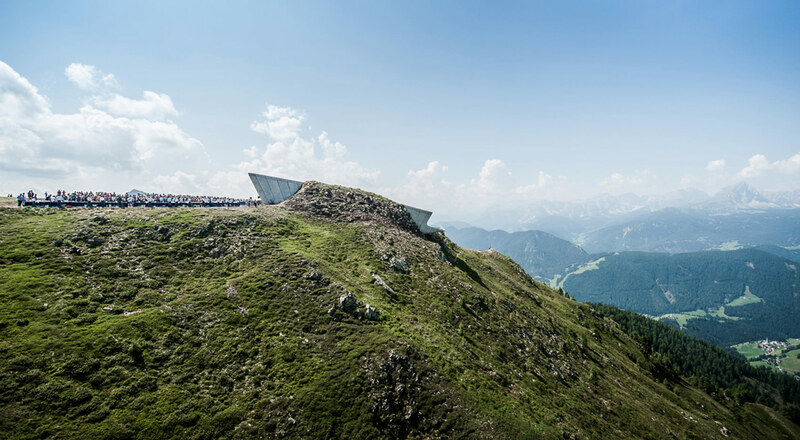 After two years of intense and complex work at the summit of the Kronplatz (South Tyrol, Italy), the new Messner Mountain Museum Corones—the sixth museum by the well-known mountaineer Reinhold Messner, designed by the prestigious architectural firm Zaha Hadid Architects—has now opened its doors to the public. The museum, devoted to the discipline of climbing, could not be better placed than as embedded in the great rocky walls of the mountain. This choice has seen it housed in a charming natural environment, the Kronplatz of the Dolomites, 2,275 metres above sea level. This aspect has lent a certain degree of complexity to this project and has kept the entire team on its toes due to the logical logistical difficulties of its construction, since many pieces had to be transported by lorry to the summit, where the work was often delayed as a result of the conditions on the mountain. The MMM Corones looks just like any other rock and does not disturb the harmony of the mountain and the surrounding natural environment. It emerges from the rock through three large masses of fibreglass-reinforced concrete, which gaze out over the mountainous landscape. In homage to Zaha Hadid’s style, characterised by curved shapes and elongated structures that avoid straight angles, concrete is the predominantly used material in this project. This substance was chosen for its adaptability and because, due to its natural colouring, it merges easily with the surroundings. It is a material that blends well with the rocks and can be seen from the outside only through the entrance. Inside, a ramp links the exhibition spaces, and there are steps in the form of waterfalls carved into the belly of the mountain leading up to three temporary exhibition levels. The ramp also links the presentation areas and a small auditorium, allowing the museum to act as the showcase for its permanent exhibition of objects, images and instruments from the Messner archives. The museum offers idyllic 240-degree views across the mountain landscape—which includes the Zillertal Alps, the Dolomites and the Marmolada glacier— and has transparent openings and balconies from which to admire them, while also providing natural interior lighting. The building was constructed in line with energy standards and has been awarded the KlimaHaus A certificate for buildings. It officially opened its doors on 24 July and will be open every day during the summer months (from 10 to 4 pm). In winter it will open its doors from the first Sunday of December to mid-April (depending on opening hours of the cable cars). Access to the site is via cable car or on foot, as part of a tour of the mountain.